High performance models from the BMW M range – the all-new BMW X5 M and the all-new BMW X6 M were launched in India today. 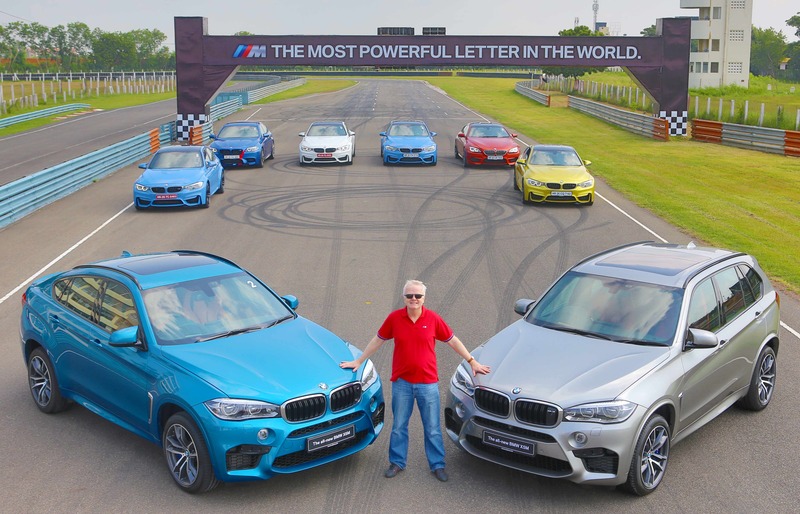 The tough off-roading characteristics of the BMW xDrive and the stunning power delivery of the BMW M range come together to give form to these winners from the BMW stable. The all-new BMW X5 M is an unbeatable combination of flexibility and superior handling while the all-new BMW X6 M exudes an imposing presence wherever it goes. Commitment to high performance that defines an M vehicle is resoundingly highlighted by the impressive performance figures of both the vehicles. *Price prevailing at the time of invoicing will be applicable. Delivery will be made ex-showroom. Ex-showroom prices (inclusive of VAT at 12.5%) as applicable in New Delhi and Maharashtra but excludes Road Tax, RTO statutory taxes/fees, Insurance and Octroi (if applicable).VAT over and above 12.5%, if applicable, will be charged extra. Prices and options are subject to change without prior notice. For further information, please contact your local Authorised BMW Dealer. The all-new BMW X5 M and the all-new BMW X6 M are available in the following seven metallic paintworks: Carbon Black, Silverstone, Black Sapphire, Melbourne Red, Mineral White, Long Beach Blue, Donington Grey and in non-metallic Alpine White color. With their striking use of forms, the all-new BMW X5 M and the all-new BMW X6 M clearly flag sporting ambitions. The M-specificdesign characteristics visually emphasize the sporty driving experience. The kidney grille with double slats, large three-part air inlet in the front apron and M twin tailpipes give an impressive look to the vehicles. The proportions of the all-new BMW X5 M signal massive power and extreme handling abilities while the flowing lines of the all-new BMW X6 M underline its extravagant coupe concept and athleticism. Inspired by motor racing, the interior follows hallmark BMW driver-oriented design of the cockpit. The new multifunctional M leather steering with integrated aluminum gearshift paddles, leather-trimmed BMW Individual instrument panel, center console with knee pads, M–specific gear selector lever, driving dynamics buttons and sill finishers with model lettering are standard offerings that deliver a true feeling of driving on a racetrack. Fine grain Merino leather upholstery with contrasting seams and embossed M logo on the backrests showcase flawless workmanship. The M TwinPower Turbocharged V8 petrol engine in the all-new BMW X5 M and the all-new BMW X6 M impresses with outstanding responsiveness and agile power delivery at any speed with astonishing efficiency. An output of 423 kW / 575 hp produces a maximum torque of 750 Nm at 2200-5000 rpm and accelerates the cars from 0-100 km / hr in just 4.2 seconds to a top speed of 250 km/h (electronically limited). The new eight-speed M Steptronic transmission with Drivelogic stands out with its exceptional precision and impressive fast-shifting ability. At any time, in any gear, the transmission collaborates perfectly with the engine enabling it to develop its full power and efficiency. The driver can also take over manual control or gear changes using shift paddles. The intelligent BMW xDrive four-wheel drive system adapts perfectly to the most challenging road surface conditions, ensuring outstanding traction at all times. Split-second response times allow the BMW xDrive to distribute drive power flexibly between the two axles for optimum grip. In this way, BMW xDrive combines the advantages of an all-wheel drive – traction, directional stability and safety – with classic BMW ‘Sheer Driving Pleasure’. The all-new BMW X5 M and the all-new BMW X6 M offer cutting edge safety technologies that provide optimal support in any situation with eight airbags, Dynamic Stability Control (DSC) including Dynamic Traction Control (DTC), Cornering Brake Control (CBC), Hill Descent Control (HDC), Anti-lock Braking System (ABS), Active Protection with Alertness Assistant, Side-Impact protection, Electronic vehicle immobilizer and crash sensors. With BMW EfficientDynamics, the all-new BMW X5 M and the all-new BMW X6 M set new benchmarks when it comes to the performance-to-fuel consumption ratio. They are equipped with a comprehensive technology package including features such as Intelligent Lightweight Construction, Automatic Start/Stop function, Brake Energy Regeneration, Electric Power Steering, 50:50 Weight Distribution and many other innovative technologies. The range of M specific BMW ConnectedDrive features numerous optional driver assistance systems, pioneering infotainment and unique connectivity. Systems such as the iDrive Touch with handwriting recognition (including a 25.9 cm high-definition colour display), full-colour BMW Head-Up Display with M View, 600 Watt 16 speaker high-end Surround Sound system from Harman Kardon and BMW apps reflect the high-level of sophisticated technology standards.